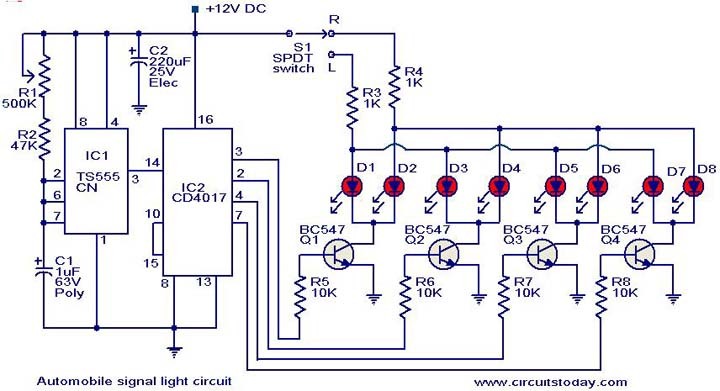 This is a simple circuit that can be used as a sequential signal light in automobiles. The circuit is based on two ICs. A TS 555 CN CMOS timer IC and a CD4017 decade counter IC. The IC1 is wired as an astable multivibrator to trigger the counter IC. When triggered, the outputs of the IC 2 (pins 3, 2, 4 and 7) will go high and low in sequence and the speed of this sequencing will be proportional to the triggering frequency. The transistors Q1 to Q4 drives the corresponding LEDs. The switch S1 can be used to select the direction of turning and the LEDs arranged at the corresponding side of the vehicle will start sequencing. The switch S1 can be the existing changeover switch of the vehicle it self. The circuit can be powered of the 12V available from the vehicle itself. The color of the LED depends on your choice . The ICs must be mounted on IC holders. Assemble the circuit on a good quality PCB . Be careful with the wiring of this circuit because any wrong connection may put the electricals of your vehicleÂ in trouble. I would like to use this circuit to make sequencing signal lights left and right rear for my motorcycle. I was thinking of using two of these circuits with 1/2 of the LEDs (eliminate the R4 part of the circuit and the LEDs attached and S1 would not be neccesary). Then the circuit would be energized when 12 volts was applied as the regular signal switch (on the motorcycle handlebar)was engaged.I would have to bypass the OEM signal flasher and come up with a circuit for the front signal lights as well (These would be simpler just off/on flasher circuit for the leds in the front enclosures). The question that I have is what voltage and wattage of LEDs can I use in this circuit? It would need to be as bright or brighter than conventional 1156 lightbulbs. Would a different transistor increase the wattage capacity for the LEDs if the BC547 was not sufficient? If so what would you recommend? I’m a novice in electronics, but I know a little bit. I have a friend that can make the circuit board for me. I have a Honda 750 cruiser and lights like this would really enhanse the look.